Ahead of the BUCS Women’s Championship trophy final on Thursday at Twickenham, we profile and preview Northumbria and Edinburgh. Northumbria University have had quite a year. 12 months ago, they suffered heartbreak at Twickenham as they lost to Cardiff Met 20-5 in the 2016 final, but they are now back at England HQ determined to go one step further this time around. 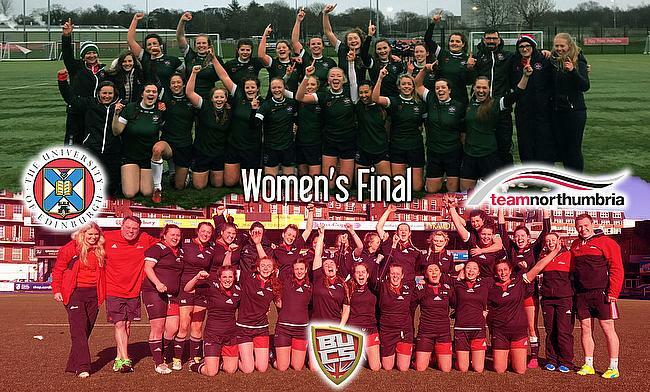 The north-east side compete in the Premier North division of BUCS Women’s rugby, but last year’s league champions were unable to retain their crown in this campaign as they were pipped to top spot by fellow finalists Edinburgh. Northumbria finished the domestic term on 39 points, just three behind Edinburgh, after eight wins from their 10 fixtures. Their only defeats came against Edinburgh and semi-finalists Durham. In the knockout stages of this year’s BUCS Championship, Northumbria showed the class they possess as they thrashed Gloucestershire 72-0 in the quarter-finals before exacting their revenge over Cardiff Met as they narrowly beat the Welsh side 19-17 to progress to the final. Northumbria’s recent history is something to admire. From finishing third in the second-tier of Women’s University rugby five years ago, the north-east outfit have continued to improve as each year has passed. Promotion to Premier North swiftly followed and now Northumbria are preparing for their second consecutive final having lost just four of their last 37 matches. That run stretches back almost three years, but one thing to note from that stat is that two of those defeats which Nothumbria have suffered came against Edinburgh. In truth, I don’t think that record will be on the minds of the Northumbria players at Twickenham as they will be fully focused on tasting glory on one of world rugby’s biggest stages. Edinburgh University compete in the same division as Northumbria and after winning eight of their 10 domestic games this season, the side from Scotland were crowned champions after completing the campaign on 42 points. They may have had the same record as Northumbria and third placed Durham, but Edinburgh were able to secure maximum bonus points from this term which helped them seal the title. One of Edinburgh’s standout results from this season was their thumping 107-10 win over Leeds Beckett in October and since then, the Scottish outfit have averaged 36 points a game. Their only losses in this campaign came against Durham and finalists Northumbria. The knock-out stages of the BUCS Rugby Championship saw Edinburgh thrash Bristol 67-5 in the quarter-finals to book their place in the last four for the first time in their last five attempts. They took on fellow Premier North side Durham in the semi-finals and beat the north-east club 22-10 to confirm their place in the final. Edinburgh have shown real progression over the last few years. Their superb 2013/14 campaign saw them clinch the Scottish 1A title, promotion to Premier North and the BUCS Trophy while the last couple of years in the top flight have seen the Scottish side finish in fourth and second place. They went one better this year to clinch the title and they also possess some rising stars in the game including Scottish Internationals Sarah Law, Rhona Lloyd, Lisa Thomson, Katie Dougan and Megan Gaffney as well as England Under-20 International Sally Stott. Edinburgh have all the ingredients to now secure the league and cup double so can they become the best university side in the country for the first time in 19 years?